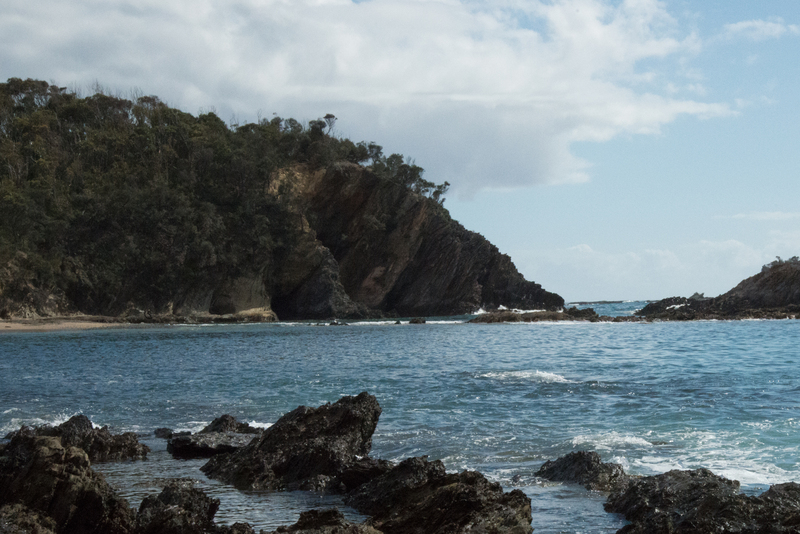 Guerilla Bay Kayak Tour – do it!! This is a geological map from Chris Fergusson and Peter Frikken in the Journal of Structural Geology in 2003. The description of the rocks below is taken from that paper. 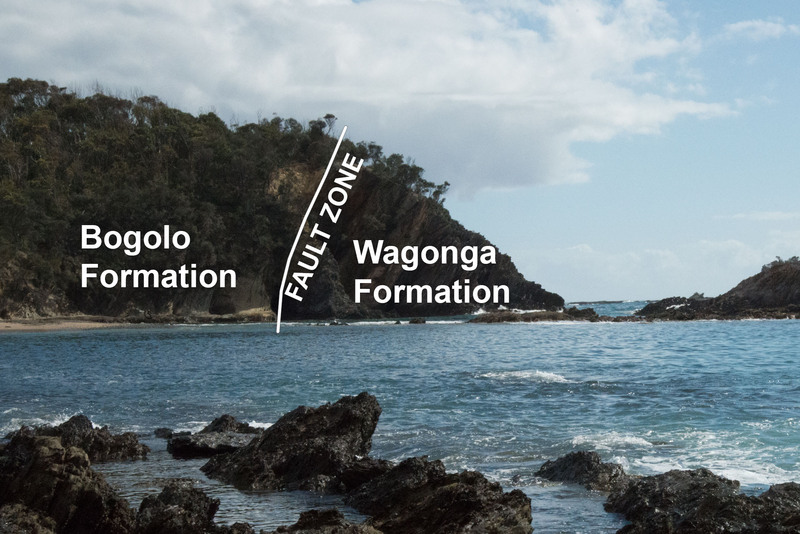 The geological unit exposed in the main beach areas of Guerrilla Bay is called the Bogolo formation. It looks a bit nondescript, but it is actually fairly rare and controversial rock type. 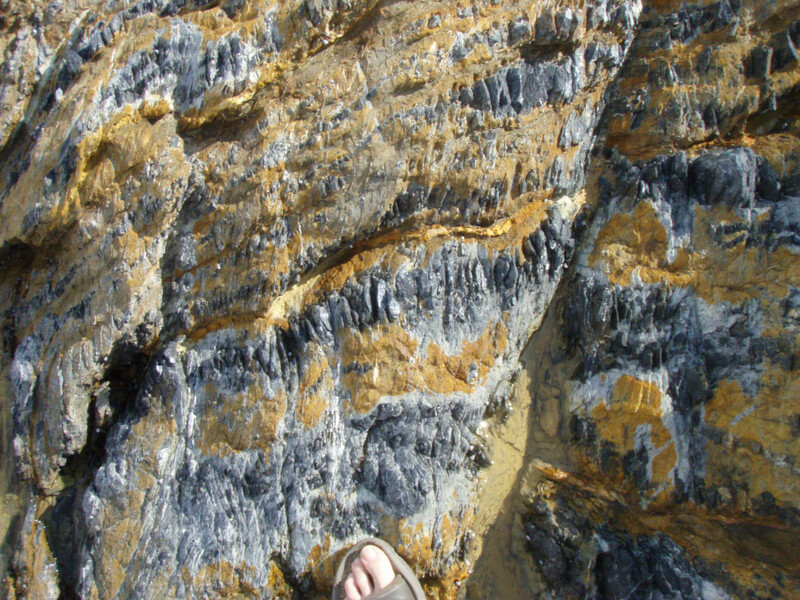 It is called a “mélange” (French for mixture), because it is a mixture of about 90%+ mudstone with fragments and blocks of sandstone from the Adaminaby Group and less common basalt from the underlying rocks mixed in. Unlike most sedimentary rocks, it has little or no layering. 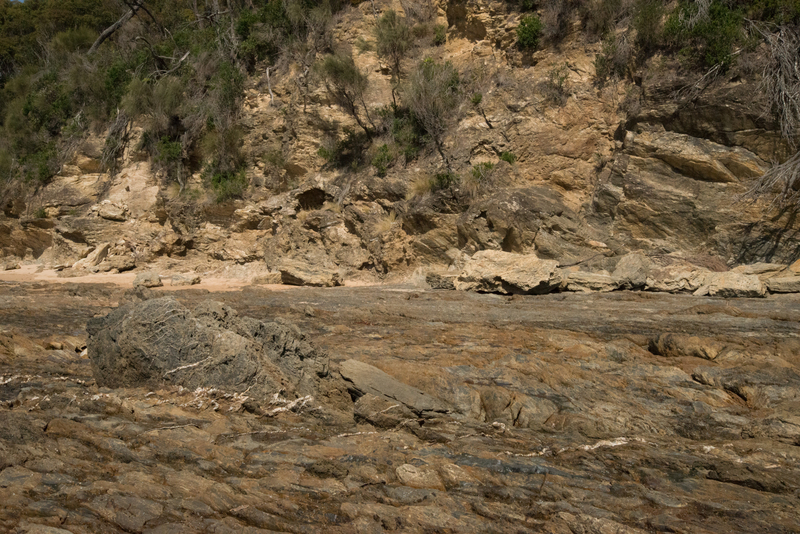 Most people agree that this is because the original mudstone (which would have been layered) was completely disrupted in the process of mixing in the blocks of sandstone and basalt. What they don’t agree about is how this might have taken place, with interpretations including a big debris flow, crunching up of the sedimentary sequence in a large fault system, or even a series of huge mud volcanoes. I’ll talk more about that in another post. The green “basaltic breccia” unit in the map is part of the Wagonga Formation and is actually the oldest rock in the area, though it would be hard to glean that just from exposures at Burrewarra Point. Palaeontologists have found a type of fossil called a “conodont” (supposedly the teeth of an ancient eel-like creature) in the sediments just above the basaltic breccias, and the characteristics of these conodonts are consistent with those known to have existed in the late Cambrian period or about 485 million years ago. 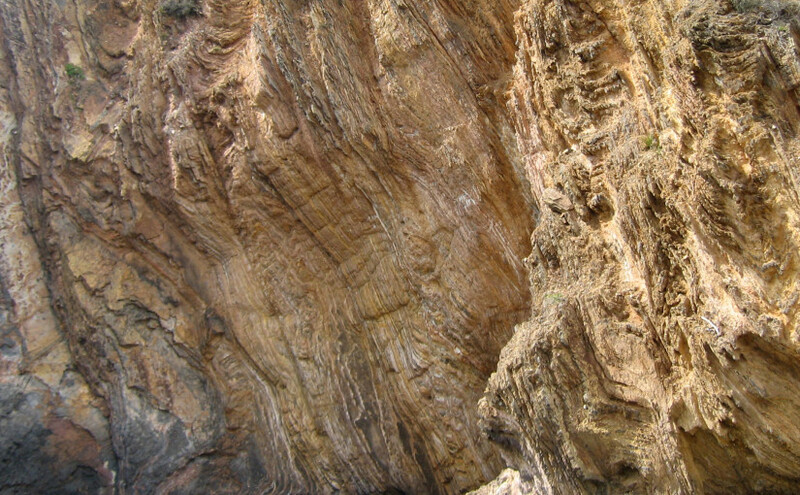 The basalts and associated limestones are interpreted to have been part of an ancient sea mount like Hawaii or Samoa. 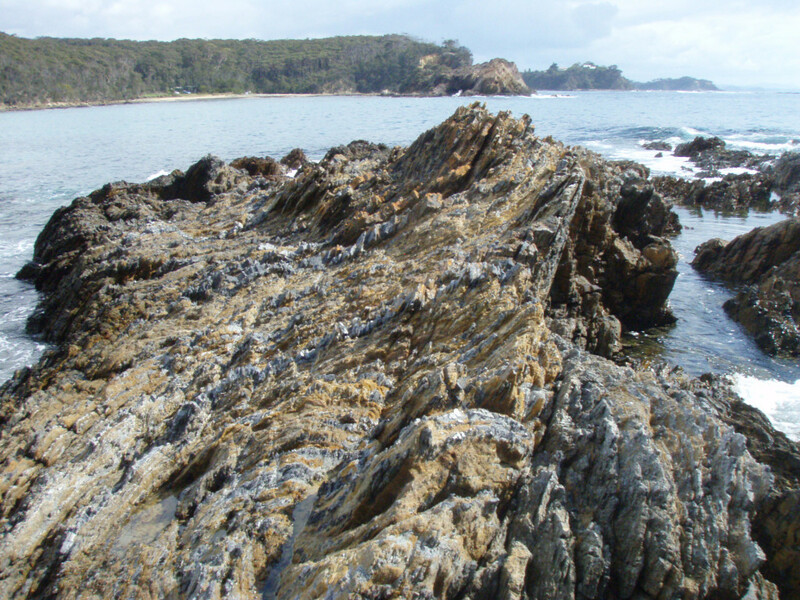 Sediments of the Wagonga Formation are the rocks that make up the Guerrilla Bay islet, and they are harder, darker, and more layered than the Bogolo formation. They are made up of a mixture of siliceous mudstone and chert, both of which are rock types which form in deep ocean settings in which the rate of sedimentation is low. 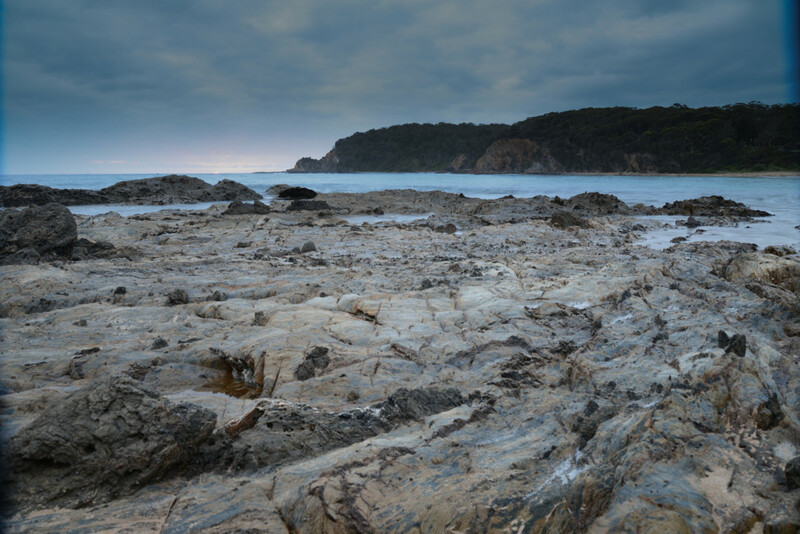 Chert is a rock made up mostly of silica, and the bedded cherts in the Wagonga formation likely formed from the skeletal material of organisms which lived in the deep ocean water column, falling to the ocean bottom after their death. 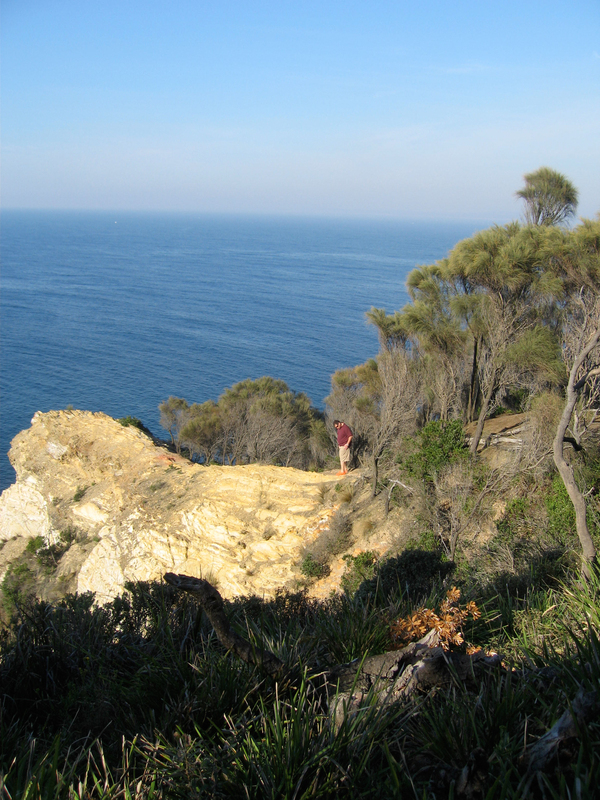 Variations in the amount of fine clay material being shed from shallower regions would have produced the variations between mudstone and chert. 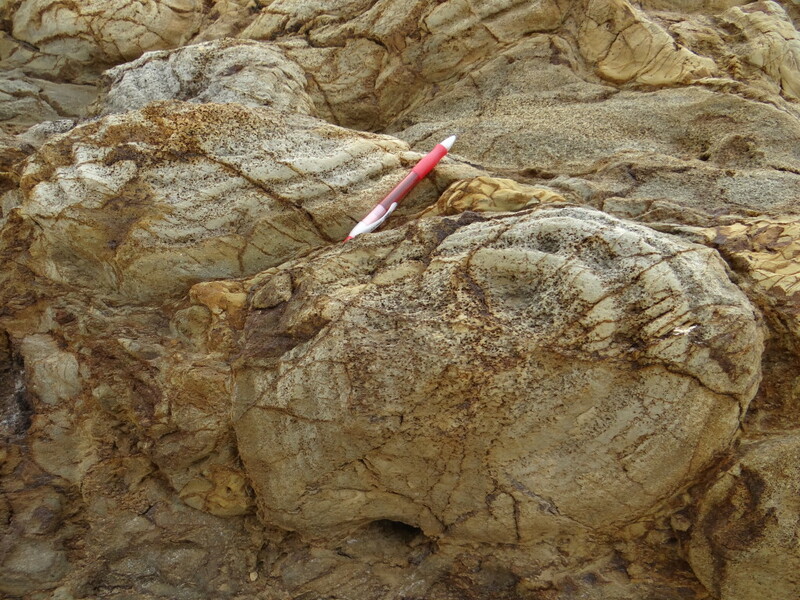 A beautiful fold in the siliceous mudstone and chert from the south side of Guerilla Bay. 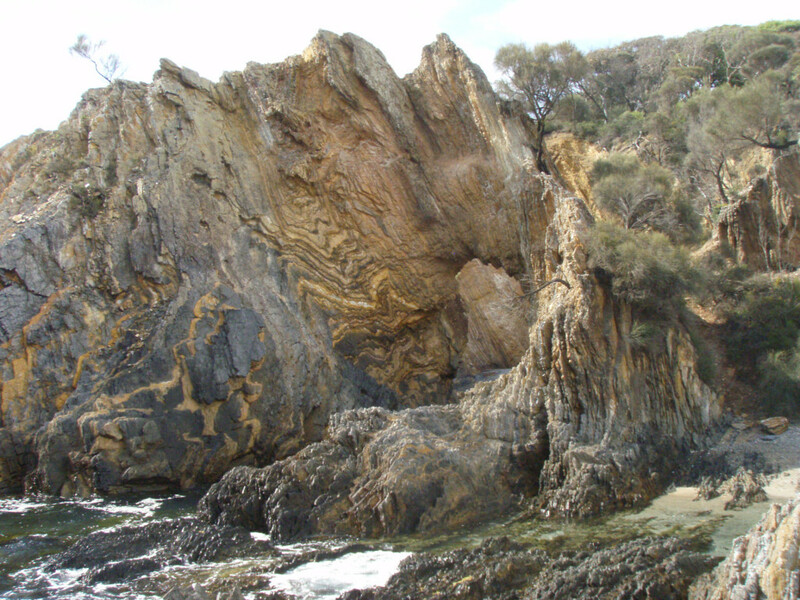 The rocks in the Guerrilla Bay area have been folded and cut up by faults after their deposition, and most of the contacts you can see are faults. A good example of this is near the cave at the north end of Guerrilla Bay. Here is a coloured map of the geology of Guerilla Bay overlain on an aerial image from Google Earth. Move the slider back and forth to go from one to the other. Here is a link to a bigger version of the same map.